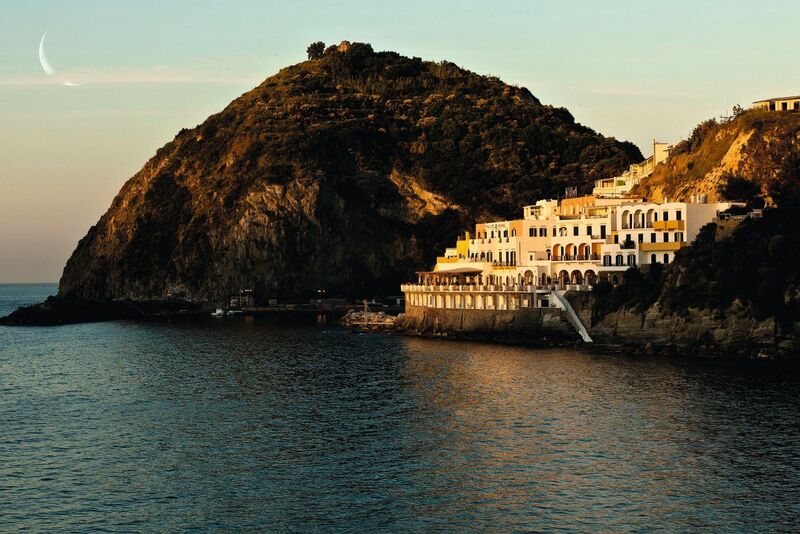 Italy’s countryside, coastlines and cites are all incredibly diverse, so it’s no wonder that the hotels are too. Situated all around this popular holiday destination are luxury, budget, family friendly and adults-only hotels, offering a range of board options from bed & breakfast to All Inclusive Italy packages. Some hotels are located right on the sandy beaches, while others have cliff top locales or are in the town centre with excellent access to the ancient sites and monuments. The Grand Hotel Ambasciatori in Sorrento. 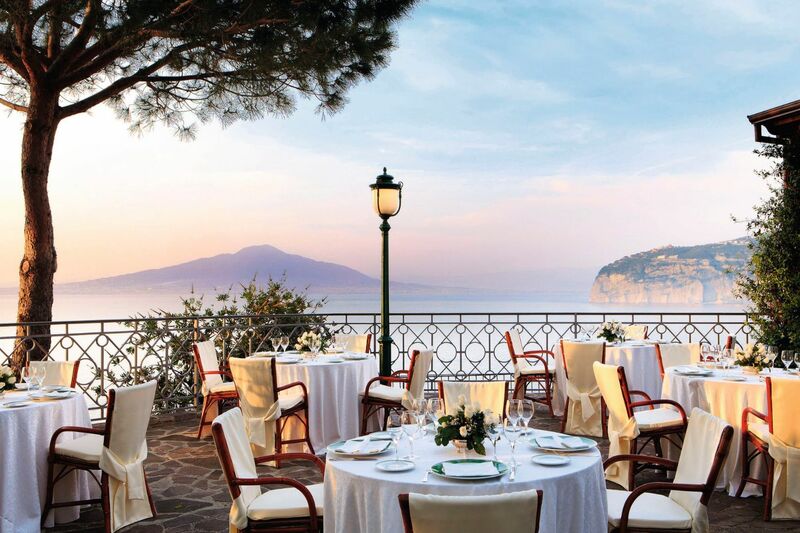 The Grand Hotel Ambasciatori lives up to its name starting with its grand Mediterranean gardens and cliff top setting. You’ll have epic views over the bay of Naples and mount Vesuvius. The hotel itself is 5* decadence and grandeur, with gala dinners and a private bathing platform to unwind on. The rooms are spacious, with their own separate sitting area, balcony overlooking the bay, large bathroom and dressing room. Plus, you’re also only a 10-minute walk away from the centre of Sorrento so there’s no need to hire a taxi here, instead you can enjoy walking along the historic Italian streets. With stand out views and romantic roof top dining it’s no wonder that the Sensimar Nastro Azzuro was awarded TripAdvisor’s certificate of excellence. Located high up in the hills you’ll get terrific views over the bay of Naples from both your room and the hotel’s classy buffet and fine dining restaurants. This is an adults-only hotel, so you can relax in a quiet and laid-back setting with just the one you love. 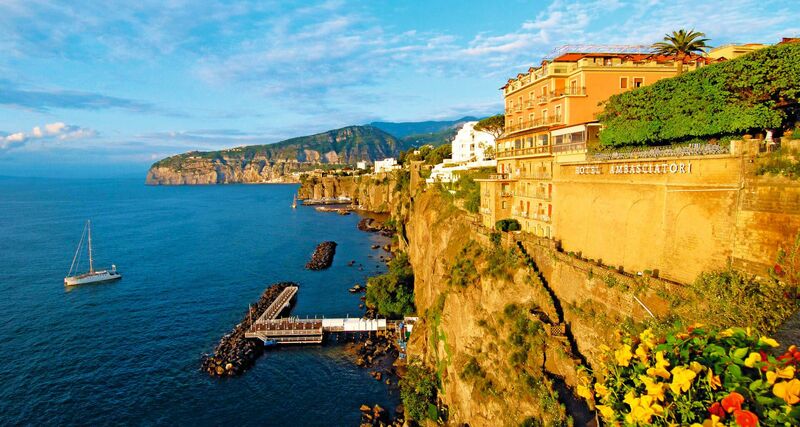 When it comes to exploring the area, you can hop onto the hotel’s courtesy bus and take a ride into Sorrento. Or head to the beach where you’ll find deck chairs and parasols scattered along the shore. You can find the Miramare Sea Resort and Spa built directly into a cliff. You’ll get world class views of the Bay of Maronti from the pool area, restaurants and your own accommodation. The hotel itself dates way back to the 1930’s and has a very classic Italian feel with plenty of character and charm throughout the building. With Aphrodite Thermal Gardens and Spa being just a 10-minute walk away, you can head here and indulge yourself in several massage treatments or swim in the thermal pools. For stand out luxury and high-end living don’t look any further than this 5* hotel. 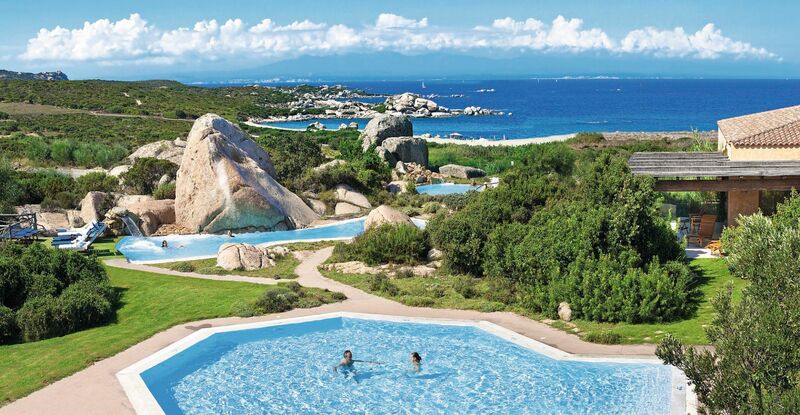 You’ll be surrounded by 69 acres of parkland with footpaths leading to your own private white sand bays and views looking over the Maddalena archipelago just off Sardinia. This stunning hotel has tons of places for you go for a refreshing dip including three pools and four saltwater thalasso pools in their own spa. Plus, the resort is completely secluded so you can relax in peace without a lot of busy traffic. Also, no need to worry about finding a spot to eat at, there are seven restaurants here for you to work your way through. 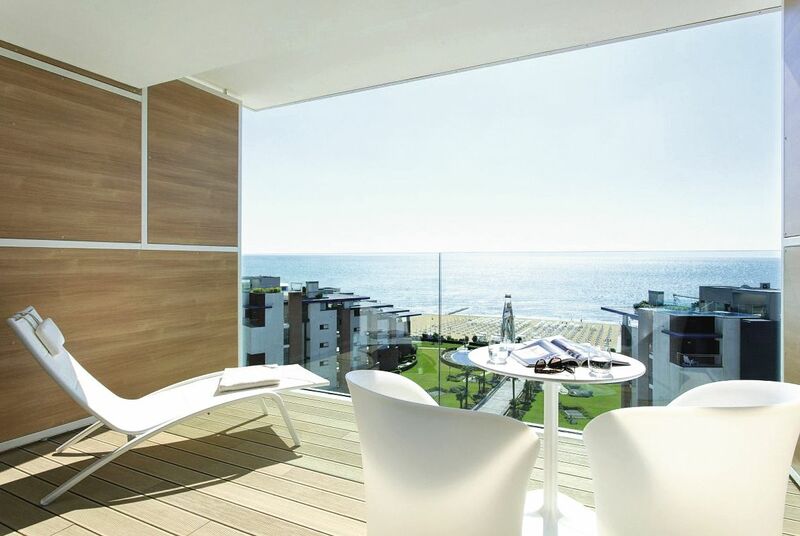 Think modern, sleek and stylish when it comes to this Italian hotel located in the stunning Venetian Riviera. You’ll be greeted with a fantastic contemporary design from the hotel lobby to your room and also to the smart pool area. The beach is just a steps away, which you can get to by strolling through the decked walkway that connects the pool to the sands. The Almablu Wellness and Spa is spread over two floors on this hotel and has a range of state of the art treatments including an ice room, kneipp therapy pool, salt pools and a geyser and water paradise. 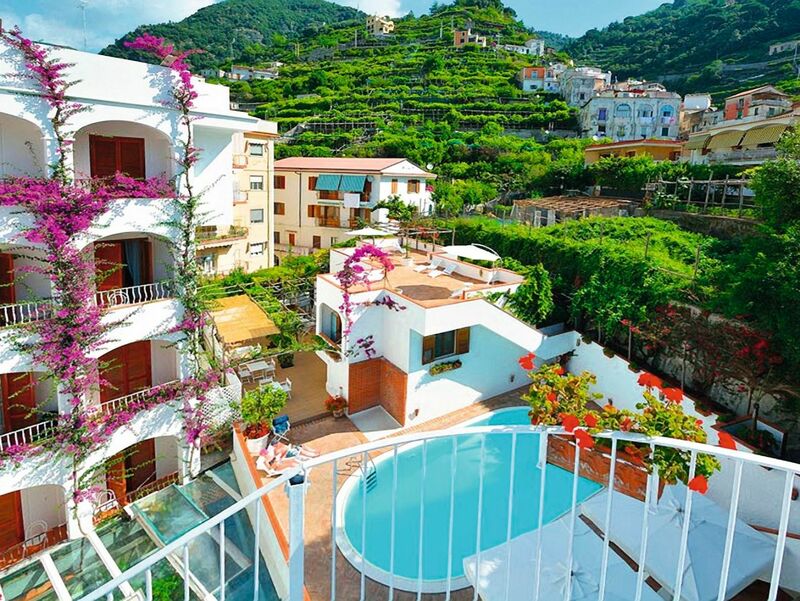 Family-run Villa Romana is located in the heart of the Amalfi coast is. You’ll be right in the middle of all the action at this charming hotel, with the coastline and beach only a five-minute walk away. The hotel itself has fantastic mountain views from its terraces and balconies, and for an even closer look at this magnificent backdrop you can head up to the rooftop sun terrace. As for the rooms, they’re spacious with plenty of room for a double bed, breakfast area and dressing table. For a little rest and relaxation you can always book yourself into the hotel’s own spa for massage treatments, a Turkish bath and sauna. The 360° views in this 5* hotel are sure to sweep you away. Built high into a cliff top, 100 metres above sea level, this hotel boasts panoramic views with Naples and Mount Vesuvius in the distance. You’ll also only be a 20-minute stroll to the harbour and nearest sandy cove. 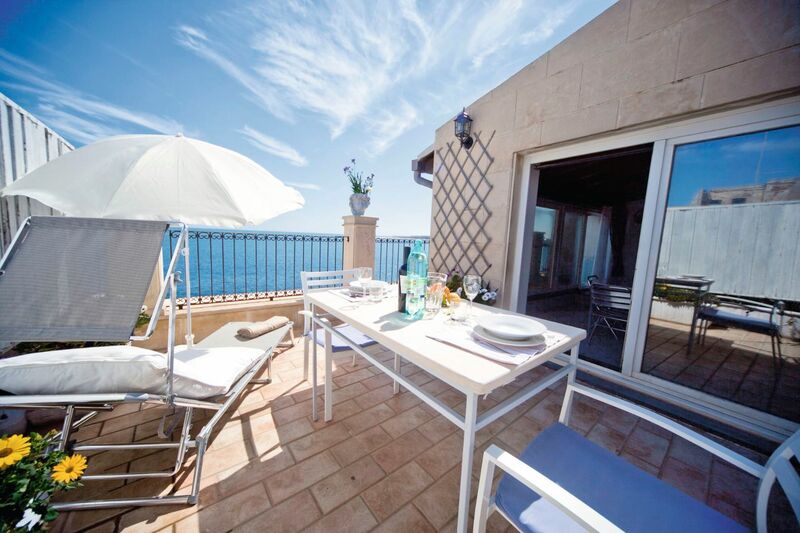 As for wining and diving, this hotel serves a continental buffet breakfast as well as having a Buganvillea restaurant with an outside terrace serving up impressive sights of the Almafi coast. 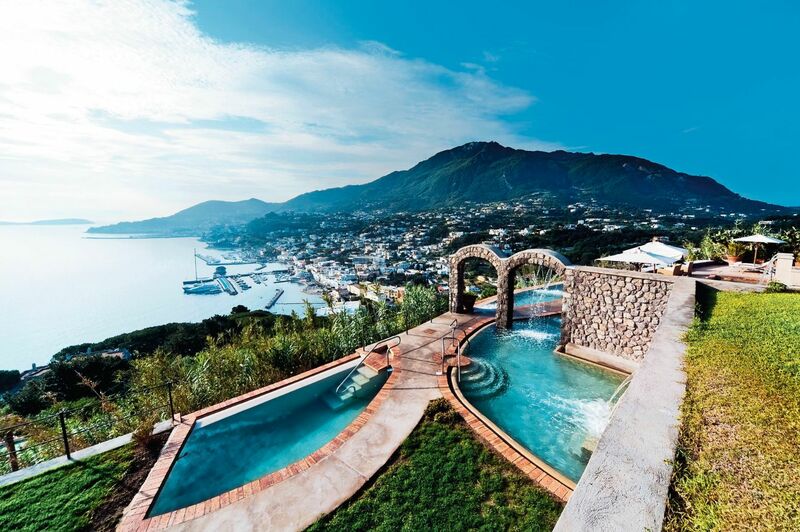 The views don’t stop here, the hotel boasts the only sea view spa in Ischia. Nizza Studios in Syracuse, Sicily. For something a little different with a great sense of authenticity, look no further than Nizza Studios. The building itself was first constructed in the 18th-century and now rocks a fantastic shabby-chic look with its furniture and bedrooms decorated with a rustic ambience, while its lounge-diner and kitchenette have been modernised. Thanks to its location, you’re in the ideal place for any Sicily sightseeing here. The Piazzo Duomo is only a 10-minute walk away with a cathedral and al fresco cafes for you to peruse. While you’re out and about you can also wander through the local market, which sells fresh fruit, vegetables, meat and seafood. So, where will you stay on your holiday to Italy? Read next 33 Things We All Do On Holiday!